Our River Road community is where you find the courage to live your values and commit to action – and it only happens with your financial support. Pledging is an essential act as a member of this congregation. In giving to River Road, we build a community that supports our spiritual growth, encourages our children to thrive, and renews us with beautiful music. 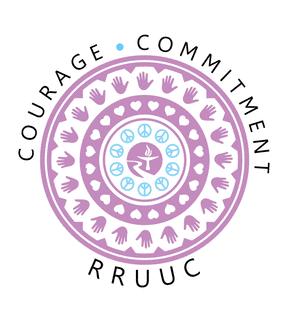 Now, more than ever, RRUUC needs courage within our community. Our community cannot remain passive in today’s changing world. Part of living our values is committing to a moral budget that provides fair compensation for our exceptional clergy and staff. Our goal is to raise $960,000 for the 2017-2018 financial year. Achieving this goal requires each of us to increase our level of giving and to commit to greater transparency. Leading by example, members of the Financial Stewardship Committee have already increased their collective financial commitment by 38 percent for 2017-18. Join us by making a courageous pledge that reflects your commitment to our River Road community. Our commitment to generosity and service in social justice is as strong as ever. Click here (www.rruuc.org/SJgiving) to find out more about our Designated Gift Organizations, which we’ll be supporting this year through monthly outreach collections. You can also extend your generosity to these faithful partners in social justice anytime – including right now! Please pledge by April 30, 2017 to ensure that the Board of Trustees has sufficient time to plan a responsible budget for the 2017-18 financial year, which starts on July 1, 2017.